Easy Dunker must always have an adult operator on duty when in use. When tank is going to be unaended, always drain water. 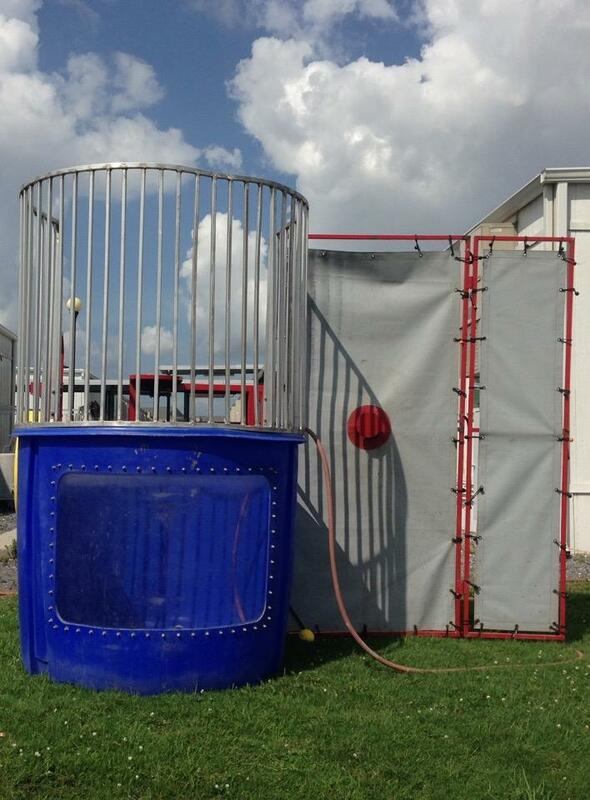 NEVER LEAVE A DUNK TANK FILLED WITH WATER UNATTENDED! Keep Easy Dunker away from electricity. Keep water level %uFB01lled to at least 8” from the top of the tank. Only one person at a time should be allowed on the seat or in the tank. Keep all non-swimmers, anyone less than 5’ tall, or over 250 pounds o%uFB00 of the tank. Anyone with medical conditions which may place limitations on their physical exertion (such as, but not limited to: heart condition, pregnancy,back injury, etc. )should stay out of the dunk tank. To keep from slipping, the dunkee must always wear rubber sole shoes. Before each dunkee climbs onto the seat, they must %uFB01rst make sure the seat is securely locked in place and that the safety latch is engaged. The dunkee should use the handles to assist in climbing out of the tank and for getting back up onto the seat after being dunked. However, the dunkee must not hold onto the handles while being dunked. The dunkee must move toward the front of the tank when coming up out of the water to avoid hi/ng their head on the seat. Never stand or kneel on seat. When being dunked, the dunkee must keep hands on knees and sit forward on the seat. Do not allow anyone to hit target with hands. Do not operate Easy Dunker during a storm.